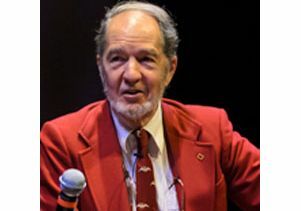 Professor of geography Jared Diamond has spent decades exploring traditional cultures around the globe, contemplating what the modern world can learn from them and turning his observations into books that engage millions of people in new ways of thinking. His 1999 book, "Guns, Germs and Steel," won a Pulitzer Prize. "Collapse: How Societies Choose to Fail or Succeed" was a best seller in 2010 and the basis for a National Geographic Television documentary. 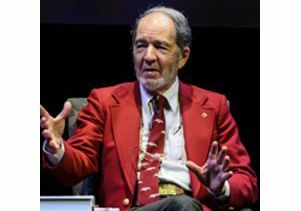 His latest, "The World Until Yesterday: What Can We Learn from Traditional Societies?," is on the New York Times best seller list, and Diamond has been on a globe-spanning book tour that recently found him getting a good-natured ribbing from twisted talk show host Stephen Colbert on "The Colbert Report." Last Tuesday evening, Diamond’s 35-cities-in-nine-countries book tour brought him to Royce Hall, where a near-capacity crowd heard his Open Mind lecture, hosted by the Friends of the Semel Institute for Neuroscience and Human Behavior. "It’s great to be here," Diamond began, describing the evening as a homecoming of sorts, with family, friends and colleagues in the audience making it "very comfortable … not as terrifying and unpredictable as ‘The Colbert Report.’"
"The World Until Yesterday" finds Diamond drawing once again upon his vast spectrum of knowledge — biochemistry, geography, anthropology, history, world languages and more — to explore the human past as it had been for millions of years. That past has largely vanished, except in traditional cultures that inhabit New Guinea, where Diamond has done extensive field work since 1964, and portions of the Amazon basin in South America. "This is my most personal book," said Diamond, "and my most practical." 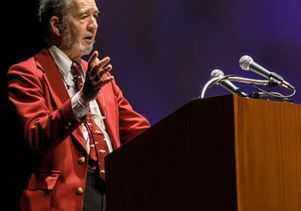 He focused Tuesday’s lecture on a chapter in his book on the treatment of old people in traditional cultures and shared his hope that western cultures can learn from this. In America, "we are throwing away our old people," said Diamond, pointing to practices like sending the elderly to nursing homes, separated from family and friends, and urging older people to retire and be replaced by "more useful" younger workers. In many tribal societies, he noted, people continue to live in multi-generational households well into old age, and they are respected and appreciated for continuing to contribute to efforts like food-gathering and childcare and serving as folk historians. Not that all tribal practices are enviable. Nomadic cultures "get rid of their elderly" when they become a burden — including widows who consent to be strangled by their brothers or sons. 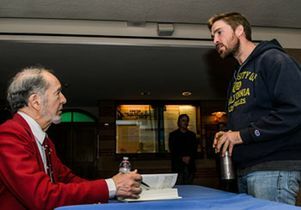 Diamond autographs his book for a UCLA student following the presentation. "To us Americans, this sounds horrible," Diamond said, but then added that this approach isn’t so far removed from the American health care system’s "age-based allocation of health care resources" where transplanted organs that are in high demand go to younger, healthier patients rather than the elderly. In a question-and-answer session following his talk, Diamond touched on several other topics from his book, from environmental devastation to conflict resolution — pointing out that traditional societies resolve conflicts face-to-face, in contrast to the western world’s dependence on lawyers and courts. Asked why his books are sometimes criticized by colleagues in academia, Diamond said that they spend decades learning to write "in boring academic language," while he prefers writing for a much wider public. Taking another question from the audience, Diamond was asked how much time he thinks the planet has to turn things around before steep population growth and environmental abuses take an insurmountable toll. 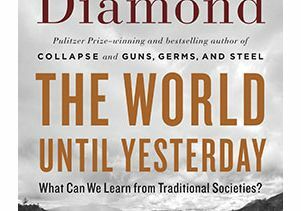 Diamond offered an estimate of about 50 years, and added that "growing consumption is more the driving force of these problems than a growing population."